This site showcases my body of work that I've produced over the years. Below you'll find some of my recent oil paintings; methodical and repetitive brushstrokes build up the translucent surfaces, bringing a thin veil of depth to the surface. The repetition is not mechanical, but in each piece follows defined rules. Through the analogue nature of human creation the discrepancies combine to create the undefined surface. Since moving to Philadelphia in 2012 I have produced a number of Oil Paintings of silhouetted figures in lofted settings, surrounded by gestural marks. These are available for sale. The repetitive aspect can be seen in much of my earlier work. Pieces like One Kilometer which comprises of a thousand meter long lines and Twenty three thousand, two hundred and thirty two PseudoGlyphs are entirely repetitious. The result of the repetition is often a veiled image, and when we look at it we can see the surface and the illusion of an image at the same time. These repetitive themes continue into the photographic pieces shown on the site. In works such as Discarded Umbrellas and Lost Glove Rug individual items that were once useful and had owners have been collected together to form new pieces. My work also engages directly with digital culture, placing emphasis on the people that occupy digital environments. Looking at any office computer monitor we usually see the left-over fingerprints that invariable get placed on our screens throughout the work day. Dirty Fingerprints is a screensaver that gathers mouse-clicks from a variety of collaborating websites, and display them as a screensaver. The HyperLight projects play with the space between the physical and the virtual, overlaying the two and placing the visitor between both. For many years I've been running Iconico.com, which hosts many of the software products and inventions that I've built over the years. 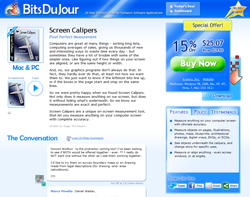 I also run BitsDuJour.com, a daily deals software website. Nico Westerdale studied fine art in Oxford, England and has exhibited in New York City. Copyright © 2019, Nico Westerdale. All rights reserved.